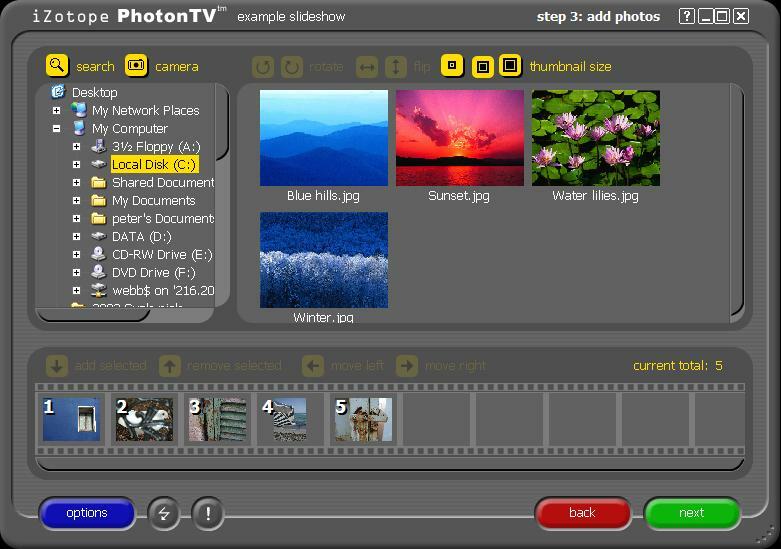 PhotonTV optimizes your photos for the television, provides features for adding soundtracks to your show, and allows you to choose from predefined templates to automatically create a menu for your show, or design your own custom menus with Adobe Photoshop. ...... and MPEG-2 parameter control. Record voice captions, create surround soundtracks and enhance the mix with control over timings, levels and more. You can even create frames to add a consistent look to each photo in the show. Add a border to your photos, or a watermark or copyright image to the corner of each one. Qweas is providing links to PhotonTV 1.02 as a courtesy, and makes no representations regarding PhotonTV or any other applications or any information related thereto. Any questions, complaints or claims regarding this application PhotonTV 1.02 must be directed to the appropriate software vendor. You may click the publisher link of PhotonTV on the top of this page to get more details about the vendor.